Slade in Flame is Slade's first soundtrack album and fifth studio album, released by Polydor on 29 November 1974 . It reached No. 6 in the UK and was certified Gold by BPI in February 1975. Produced by Chas Chandler, the album contains songs featured in the band's film of the same name. The band tried to give the album a "sixties" feel, as the film was set in the late 1960s. In the US, the album was released on the Warner Bros. label, with "The Bangin' Man" replacing "Summer Song (Wishing You Were Here)" & "Thanks for the Memory" replacing "Heaven Knows". By 1974, Slade had become a big success in the UK, Europe and beyond; however the band felt that continuing to provide 'more of the same' was not what they wanted to do. The band's manager Chas Chandler suggested Slade do a movie, to which the band agreed. Rather than producing a film portraying the band's "happy-go-lucky" image, the subject matter was based on the gritty tale of the rise and fall of a fictional 1960s group called Flame. The script, written by Andrew Birkin and Dave Humphries, was largely based on true music business events that had occurred to Slade and other groups of the time. To accompany the film, Noddy Holder and Jim Lea began writing material for a soundtrack album, which would continue to see the band break out of their successful formula and try different musical ideas. Holder told Disc in 1974, shortly prior to the album's release: "We put in a lot of hard work on this film. Jimmy and I wrote most of the songs for it while we were on the last [American] tour, and concentrated on writing really good songs." Having completed their fifth US tour, the band then recorded the new album. Powell told Bill Henderson of Sounds: "We knew the basic storyline of the film so Nod and Jim wrote the songs to fit. We didn't have any free time so they had to write it on our last American tour and then we rehearsed them as we went along - getting to the halls earlier and in hotel rooms and things. Then we spent like two weeks solid in the studio putting it together." Once recording was finished, the album was mixed by Chandler in New York. In October 1974, the lead single "Far Far Away" was released and reached No. 2 in the UK. The Slade in Flame album followed in November, peaking at No. 6. Though the record was lauded by critics, the album did not sell as well as expected, particularly as the band's previous three albums had all reached number one. In January 1975, the Slade in Flame film was released. Although it later received recognition as one of the greatest rock films, the initial reception towards the film was less positive, particularly from fans. Slade's audience did not expect the band to produce a film with a bleak and sour atmosphere. In February 1975, the second and final single, "How Does It Feel", was released and reached No. 15 in the UK, breaking a run of twelve Top 5 UK hits. Speaking of the album to Colin Irwin of Melody Maker in 1974, Hill said: "We feel that with the new album we've certainly moved. The new album is a move-on, it's a lot of new music. People go on about formulas for records and all that, but I'd like to put all our records together and see how much they differ. To me they do and the new album is definitely a new stage. We've got some saxes and some heavy stuff on it, and a theme tune which is very different for Slade." Speaking of the use of brass on some of the album's tracks, Powell commented to Sounds in 1974: "It's the first time we ever used anything outside the group before. It was really strange having other guys in the studio and then listening back to it afterwards. We sound like a real group! We used the brass to augment a few things. And Nod and Jim's writing is getting a lot better, trying to be a bit more experimental now." The album was originally scheduled for release on 22 November 1974 but Polydor were unable to produce enough copies to cover pre-order sales. Prior to its release, the album was awarded a Gold Disc based on pre-order sales. Disc reported in January 1975 that the album had sold over 170,000 copies and in February 1975, it had surpassed 200,000 sales in the UK. Record Mirror commented: "Because Flame is set in the 1960s, the album has a distinctive 1960's flavour, which should take a few of us hopping down memory lane. Because the songs have been taken out of context, a few of them have lost their charm and meaning but nevertheless, it is an enjoyable elpee." In 1975, Record Mirror voted the album No. 5 on their list of the Top 10 best albums of 1974. Disc said: "This is the album from Slade's debut film. The group that's playing is not supposed to be them but the music included here certainly sounds like the Slade we all know and love. Only occasionally, do they stray from the usual mould. A touchy album but definitely more good than bad." Dave Lewis of Acton Gazette stated: "The tracks are all standard Slade material - short punchy pop-rock songs with the emphasis on a steady beat and catchy chorus, though there's not a great deal of variety between them. Occasionally they come up with a really attractive, melodic song as with "Far Far Away", but this is very much the exception to the rule, which seems to demand getting as many boots stomping and scarves waving as they possibly can. Still, that's what they made their name doing and that's undoubtedly what they've best at." Michael Hewins of the Coventry Evening Telegraph wrote: ""Far Far Away" was melodic - who would have expected that of [Slade] at the start of 1974? Certainly the opening (and best) track of Slade in Flame is indicative of the recent change of emphasis, for "How Does It Feel" has both melodic and lyrical charm. Yet the perhaps inevitable change is not completed overnight for [Slade] can still rock as in days of yore. The overall feel on a number of tracks still retains the Beatles influence so evident on Old New Borrowed and Blue, while the "boot" feel of so many of those old singles live on in tracks like "Standing on the Corner". I like the new Slade, but am thankful that this album gives us a taste of two eras." Bruce Meyer of the American newspaper Fort Lauderdale News (of Florida) described the album as "the most balanced and listenable collection Slade has ever released on this side of the Atlantic." Tom Von Malder of the Daily Herald (of Chicago) commented: "This movie soundtrack shows that Slade also contains the potential for growth. The opener "How Does It Feel" has a softer sound that the band's usual hard-rock, assault fare and is lyrically much more sophisticated than the bulk of the group's work. The addition of a horn section on several cuts is also a plus. Two other good songs are "Standin' on the Corner" and "Far Far Away"." Al Rudis of the Chicago Sun-Times said: "Slade once again comes up with some good ballads and lots of bone-rattling good-time rock and roll." Billboard wrote: "Raspy-voiced Noddy Holder and his cohorts are rocking as hard as ever. This LP is soundtrack to Slade's Stardust type film Flame and has rather more softer cuts than is usual for this group." The magazine considered the "best cuts" as being "Far Far Away", "Bangin' Man" and "How Does It Feel". American music industry trade magazine Record World picked the album as an "album pick" and commented: "Topping the FM-oriented disc are "How Does It Feel", "Standin' on the Corner" and "This Girl"." After the film was shown on British TV in December 1987, London Evening Standard advised people to listen to the soundtrack instead of watching the movie. 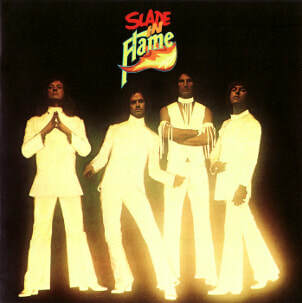 In 2007, Classic Rock listed Slade in Flame as No. 18 on their "49 Best Soundtrack Albums" list. In 2010, the magazine considered the album an "essential classic" and wrote: "In contrast to the mostly fan-based popularity of Slayed?, Slade in Flame is the album that critics tend to cite as the band's best. Slade in Flame confirmed that by 1974 Slade's music had moved away from glam-rock that had made them a household name. The band were still capable of being loud and yobbish, of course, but the wistful maturity of the album's singles began to show evidence of a new versatility." Geoff Ginsberg of AllMusic retrospectively said: "Slade in Flame is a tough album to judge. Made as an accompanying piece to the movie of the same name, it was different than the group's other records. It's an artistic tour de force for a band that was looked on as "just a good time." Although Slade was that, the band had a lot more in its bag of tricks, and this album shows it. Don't worry, though, because it's still pure Slade. The album stretches the band's stylistic universe to include brass and more keyboards than before. The lyrics are a little more serious than you might expect. From the opening number, "How Does It Feel," Slade sets a different tone." "How Does It Feel" was featured as the theme tune to the film. The melody had originally been written by Lea in the early 1960s and was brought out of the cupboard for Flame. The song features organ, flute and brass backing in places. "Them Kinda Monkeys Can't Swing" is an up-tempo rock track featuring slide guitar from Dave Hill. In the film, the song is performed by Flame in their first appearance on screen. "So Far So Good" was used as Flame's first hit. The track was covered by Alice Cooper songwriter Mike Bruce on his 1975 solo album In My Own Way. "Summer Song (Wishing You Were Here)" has lyrics based around a holiday romance and was featured in an in-concert scene in the film. "O.K. Yesterday Was Yesterday" was also featured during an in-concert scene in the film. "Far Far Away" was largely written by Holder, with lyrics about a "man who has seen the world but still feels the pull of his roots". As revealed in Holder's biography, "Far Far Away" remains his favourite Slade song. "This Girl" is a clavinet-driven song. In the film, an alternative version was used with a different set of lyrics, performed by Roy Priest and the Undertakers, with Holder's character Stoker performing the song on stage from inside a coffin. Lea told Record Mirror in 1974: "The trouble with the film business is that it's always chopping and changing. We wrote a song called "This Girl" which ended up not being in the film at all so we changed the lyrics and we used it at the beginning for a group called The Undertakers which is a pretty menacing horror act, so it's got horror lyrics." "Lay It Down" also makes use of a brass section during the song. "Heaven Knows" functioned in the film as the B-Side to Flame's hit single, where it is heard being given a quick spin by pirate DJ Tommy Vance. "Standin' On the Corner" features a horn section. In a 1989 fan club interview, Don Powell singled the song out as one of the band's best efforts on record: "I suppose "Standin' On the Corner", from the film Flame. It's got a great swing to it and it's the first time we even used brass."